The ear can be divided into three parts: the outer ear, middle ear and inner ear. To convert mechanical signals from the middle ear into electrical signals, which can transfer information to the auditory pathway in the brain. To maintain balance by detecting position and motion. In this article, we shall look at the anatomy of the inner ear – its position, structure and neurovascular supply. The inner ear is located within the petrous part of the temporal bone. It lies between the middle ear and the internal acoustic meatus, which lie laterally and medially respectively. The inner ear has two main components – the bony labyrinth and membranous labyrinth. Bony labyrinth – consists of a series of bony cavities within the petrous part of the temporal bone. It is composed of the cochlea, vestibule and three semi-circular canals. All these structures are lined internally with periosteum and contain a fluid called perilymph. 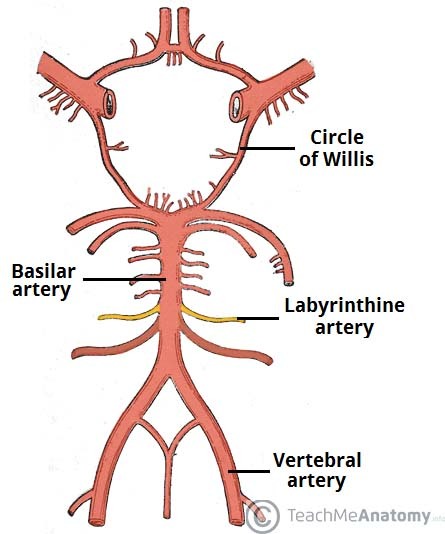 Membranous labyrinth – lies within the bony labyrinth. It consists of the cochlear duct, semi-circular ducts, utricle and the saccule. The membranous labyrinth is filled with fluid called endolymph. The inner ear has two openings into the middle ear, both covered by membranes. The oval window lies between the middle ear and the vestibule, whilst the round window separates the middle ear from the scala tympani (part of the cochlear duct). The bony labyrinth is a series of bony cavities within the petrous part of the temporal bone. It consists of three parts – the cochlea, vestibule and the three semi-circular canals. The vestibule is the central part of the bony labyrinth. 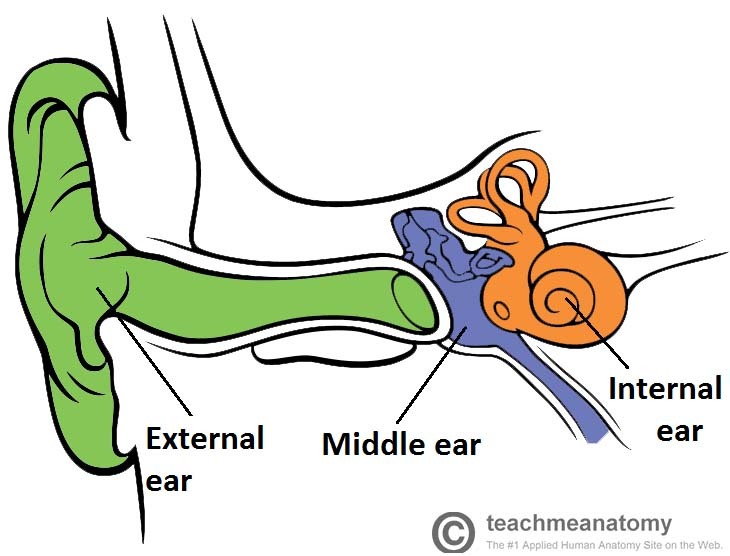 It is separated from the middle ear by the oval window, and communicates anteriorly with the cochlea and posterioly with the semi-circular canals. Two parts of the membranous labyrinth; the saccule and utricle, are located within the vestibule. The cochlea houses the cochlea duct of the membranous labyrinth – the auditory part of the inner ear. It twists upon itself around a central portion of bone called the modiolus, producing a cone shape which points in an anterolateral direction. Branches from the cochlear portion of the vestibulocochlear (VIII) nerve are found at the base of the modiolus. Scala vestibuli: Located superiorly to the cochlear duct. As its name suggests, it is continuous with the vestibule. Scala tympani: Located inferiorly to the cochlear duct. It terminates at the round window. There are three semi-circular canals; anterior, lateral and posterior. They contain the semi-circular ducts, which are responsible for balance (along with the utricle and saccule). The canals are situated superoposterior to the vestibule, at right angles to each other. They have a swelling at one end, known as the ampulla. Fig 2 – The three parts of the bony labyrinth. The membranous labyrinth is a continuous system of ducts filled with endolymph. 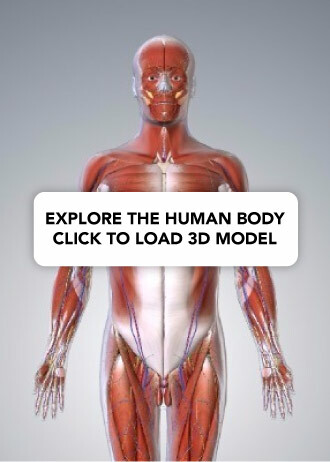 It lies within the bony labyrinth, surrounded by perilymph. It is composed of the cochlear duct, three semi-circular ducts, saccule and the utricle. The cochlear duct is situated within the cochlea and is the organ of hearing. The semi-circular ducts, saccule and utricle are the organs of balance (also known as the vestibular apparatus). Lateral wall – Formed by thickened periosteum, known as the spiral ligament. Roof – Formed by a membrane which separates the cochlear duct from the scala vestibuli, known as the Reissner’s membrane. Floor – Formed by a membrane which separates the cochlear duct from the scala tympani, known as the basilar membrane. The basilar membrane houses the epithelial cells of hearing – the Organ of Corti. A more detailed description of the Organ of Corti is beyond the scope of this article. Fig 3 – Structure of the cochlea, and borders of the cochlear duct. The saccule and utricle are two membranous sacs located in the vestibule. They are organs of balance which detect movement or acceleration of the head in the vertical and horizontal planes, respectively. The utricle is the larger of the two, receiving the three semi-circular ducts. The saccule is globular in shape and receives the cochlear duct. 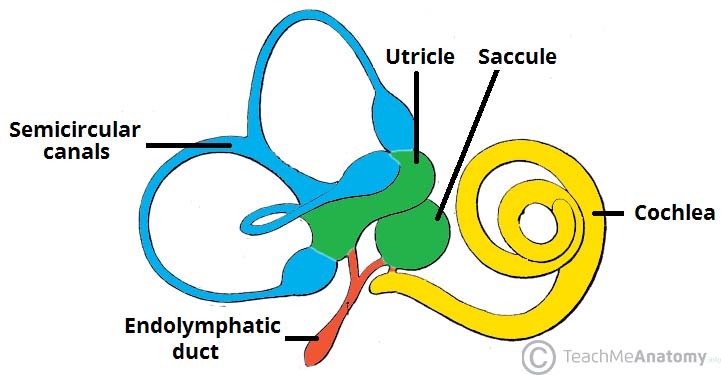 Endolymph drains from the saccule and utricle into the endolymphatic duct. The duct travels through the vestibular aqueduct to the posterior aspect of the petrous part of the temporal bone. Here, the duct expands to a sac where endolymph can be secreted and absorbed. The semi-circular ducts are located within the semi-circular canals, and share their orientation. Upon movement of the head, the flow of endolymph within the ducts changes speed and/or direction. Sensory receptors in the ampullae of the semi-circular canals detect this change, and send signals to the brain, allowing for the processing of balance. Fig 4 – The components of the membranous labyrinth. Anterior tympanic branch (from maxillary artery). Petrosal branch (from middle meningeal artery). Stylomastoid branch (from posterior auricular artery). Cochlear branch – supplies the cochlear duct. Vestibular branches (x2) – supply the vestibular apparatus. Venous drainage of the inner ear is through the labyrinthine vein, which empties into the sigmoid sinus or inferior petrosal sinus. Vestibular nerve – enlarges to form the vestibular ganglion, which then splits into superior and inferior parts to supply the utricle, saccule and three semi-circular ducts. Cochlear nerve – enters at the base of the modiolus and its branches pass through the lamina to supply the receptors of the Organ of Corti. The facial nerve, CN VII, also passes through the inner ear, but does not innervate any of the structures present. Meniere’s disease is a disorder of the inner ear, characterised by episodes of vertigo, low-pitched tinnitus and hearing loss. The symptoms are thought to be caused by an excess accumulation of endolymph within the membranous labyrinth, causing progressive distension of the ducts. The resulting pressure fluctuations damage the thin membranes of the ear that detect balance and sound. In which part of the temporal bone is the inner ear located? What lies directly inferior to the cochlear duct? What forms the lateral wall of the cochlear duct?